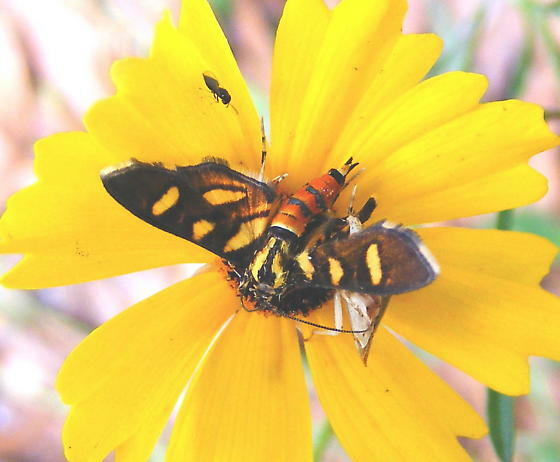 Moth preyed upon by Phymata fasciata on a Coreopsis leavenworthii flower. I considered Sesoidea or Metal-mark moths. The tiny bystander, wasp perhaps, in the upperleft is interesting, too. What little I can see of the bug looks much more like a pentatomid to me. Several of the latter are predaceous, or scavengers. But you were there to see it in person, so why doubt? Still, any other photos from different angles? Thank you for the prompt and accurate response. Cheers to thee.